Gunnar gained national fame in 2017 with an apprehension on the reality TV show Live PD; pictured here with Deputy Jason Hunt. Inside a vacant house that soon will be torn down in Spokane's East Central Neighborhood, Gunnar is following his nose. The Spokane County Sheriff K9 is looking for a woman hiding in a tiny closet during a training exercise. He runs from room to room, past the busted old stove and the police robot sitting by the door. A group of deputies stand outside the house huddled around smartphones, watching through the robot's camera as the pup sweeps his nose across the floor searching for a human scent. Some of them are part of the department's K9 unit, and others are members of the SWAT team. They're training together today in order to introduce the dogs to the robot. Both are great tools for searching for people who don't want to be found, says Deputy Jason Hunt, but each has limitations. "We can send a robot in there, like we would a dog, without putting people in danger, and can search a building pretty well through the robot's camera," says Hunt, training coordinator for the Sheriff's Office K9 Unit. "But maybe the robot doesn't see anybody, because there's places where people can conceal themselves where the robot's camera can't see. So that's where the dog comes in." As Hunt watches Gunnar search the house, he notices a change in behavior when the 5-year-old German Shepherd picks up the scent through a brick wall. "There, he's got it," he says to the other deputies. Within seconds, Gunnar sniffs his way to the closet door and lets out a single bark. Gunnar came from Slovenia when he was only a few months old, and has trained and worked with Hunt ever since. He's one of five K9s in the Sheriff's Office. Four are patrol dogs, used for tracking people, and one is an explosives detection dog. "Tracking is our bread and butter," Hunt says. "That's where we do the majority of our work." He says Gunnar has found people in all sorts of places: in a mattress box spring, between wall studs, in trash cans and in a dryer. One of the most well-known notches on Gunnar's collar is escaped psychiatric patient Anthony Garver, who fled out a window from Western State Hospital in 2016. Garver was committed to the psychiatric hospital after being found incompetent to stand trial for the torture and murder of a 20-year-old woman. After he escaped, Garver bought a bus ticket to Spokane, where his parents live. After days of searching with no success, the Sheriff's Office called Hunt and Gunnar to search for Garver in the woods surrounding his parents' home. "We had a general 100-acre area where we thought he might be," Hunt says. "We basically had no idea. No clue. We thought he was in those woods somewhere." 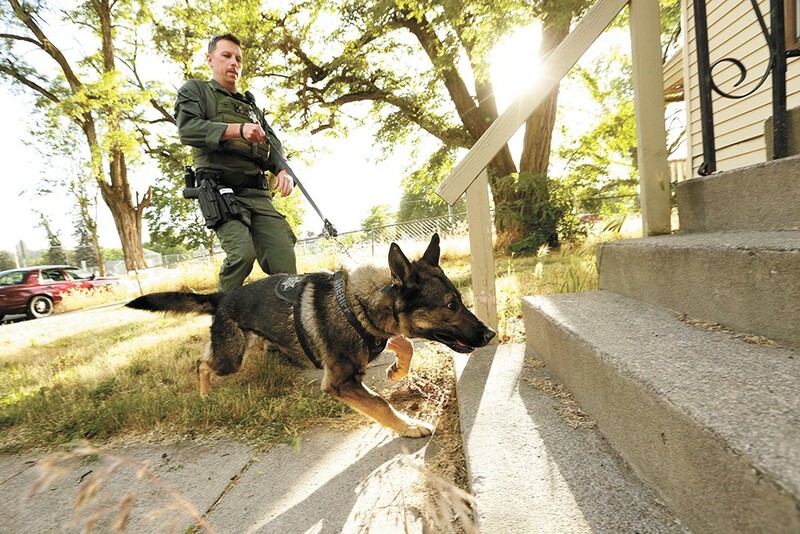 Hunt describes walking behind Gunnar when all of a sudden the dog makes a 90-degree turn and leads the deputy down a steep drop-off to a flat area. Then Gunnar's head pops up — a signal that they're getting close. Hunt can't see anyone, but warns that if Garver doesn't come out, Gunnar will find him and he will get bit. "OK, OK, OK," he recalls Garver saying after he crawled out from under a blanket and a pile of debris. "He said, 'I didn't think you guys could ever find me out here.'" Gunnar, as well as the other patrol dogs, track people by following the microscopic skin cells they leave behind, as well as the smell of disturbed vegetation. 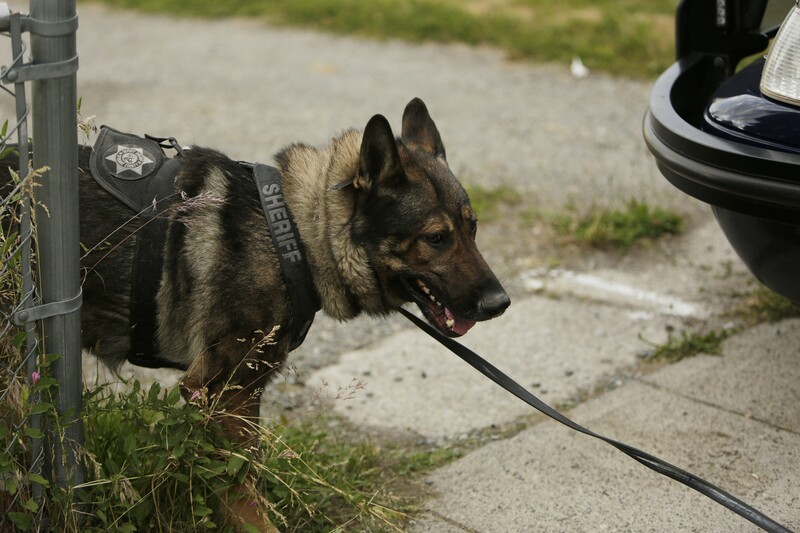 When the dog finds someone, if it can get to them, it's trained to bite and hold until a deputy gives the command to let go. (Gunnar's commands are spoken in German.) Most people give up before it gets to that point, Hunt says. At the end of the day, Gunnar goes home with Hunt and spends time playing tug and fetch with his son. "They're such a useful tool, and there's such a misconception that they're these man-eating landsharks, but they're really not," Hunt says. "He's just a normal dog except he's from Slovenia, not SCRAPS." The original print version of this article was headlined "Crime Stinks"